"Overnight, our drab corner store had turned into a gaudy consumer paradise. And I, as customer, was king." When freedom is tasted for the first time, there is a kind of euphoria that sets in. Whether the freedom stems from school letting out for the summer, graduation, moving out for the first time, or taking a trip by yourself, it creates a fresh feeling of excitement. On a much grander scale, the advent of democracy brings on a kind of knee-jerk excess that is afforded by such newfound liberty. When the Berlin Wall crumbled, the East got its first taste of such amenities, and with the grant of new possibilities, restraint is antiquated. Alexander Kerner is aware of these things, and wants desperately to shield his mother from the truth. Alexander (Daniel Brühl) grew up under the heel of Communist-controlled Berlin, though he had little disdain toward the government. He spent his time dreaming of the stars, engrossed in his favorite Cosmonauts and their daring adventures. His father has escaped to the West, supposedly with another woman, leaving his two kids behind. Alex's mother (Katrin Sass) is broken and depressed. She finds salvation by marrying the state, so to speak. Through countless petitions and enthusiastic activism that upholds the system of her beloved East, she displays her loyalty to maintain her sanity. Alex hits the teenage years, and protests against the government his mother holds so dear as such actions become commonplace. He rides the wave of outrage, seemingly looking for nothing more than something to do, as opposed to an outlet for rebellion. When a riot breaks out during a march, his mother sees Alex hauled away, arrested. She collapses, has a heart attack, and is lost in the haze of a coma. Alex feels responsible, but this event has led to a new beginning: he has met his first love, Lara (Chulpan Khamatova), a nurse at the local hospital. With new love comes great social change. While Alex's mother is unconscious, the Wall falls, and the world as he knows it transforms. To his surprise, Mother wakes up, but is still at risk for another heart attack, unless any hint of excitement or anxiety can be eliminated from her life. What could be more unsettling than her beloved communist system becoming kaput? Alex begins a multilateral campaign to restore East Germany for his mother, within the confines of her small bedroom. Everything is controlled, from the food she eats (rare brands he must scour the city for), to the television she watches, which are pre-recorded fictional segments created by Alex's aspiring filmmaker friend, Denis (Florian Lukas). How long can he uphold this illusion before Coca-Cola and rock music somehow seep between the cracks, and the truth is revealed? 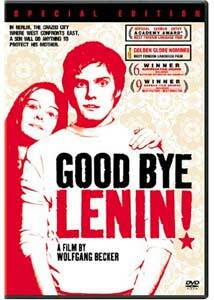 Wolfgang Becker has created a touching, charming drama/comedy in Good Bye, Lenin! What begins as a massive effort to save Alex's mother from stress ultimately becomes the creation of something special: the vision of an East Germany that only exists in Alex's mind. When things go wrong, he and his cohorts must spin events in such a way that maintains the façade of Communism, but ultimately becomes the vision of a country with far more liberty and justice. Alex does so unconsciously, focused only on saving his mother, for which he has an undying love. Brühl and Sass capture this connection perfectly. Recreating East Berlin was a monumental task during the course of this production. In a mere 12 years, the traces of the once desolate side are all but gone. Utilizing seamlessly integrated digital effects, little touches were placed throughout the frames, restoring the city to its former look. Strangely, the local inhabitants seem less displeased with their living conditions as one may expect, but dialogue and actions hint at the oppression and fear they face. Moments of weight occasionally come off as rushed; however, at times, the story can drag, and seeing the old routine of pulling the wool over the mother's eyes can get repetitive, but there is more to like than dislike. Performances, visuals and Yann Tiersen's emotive, Amélie-esque score (including a piece lifted right from the Jeunet's film) created film that moved me. It has a great heart and appropriately treats politics as backdrop to relationships, thankfully not vice versa. Image Transfer Review: Columbia's anamorphic 1.85:1 transfer shows good detail, bold color and solid contrast. At times, the image does appear a bit soft and muted, without distraction. Edge enhancement is minimal, but there is some minor grain to deal with. Audio Transfer Review: The Dolby 5.1 mix is mostly front heavy, but the surrounds provide a nice fill for the memorable, piano-heavy score. Dialogue is clear and LFE kicks in when needed, creating a natural, pleasant track. Extras Review: Columbia has packed this special edition with a boatload of extras that were no doubt ported from the original German DVD release. First is a pair of commentaries, both in German with English subtitles. Track One features director Wolfgang Becker, who talks a mile a minute about the origins of the project, his meetings with Yann Tiersen on the score, visuals, and more. He does fall into describing what happens on screen at times. Next is a more conversational cast track that includes input from Daniel Brühl and Katrin Sass. There is no listing provided as to who exactly is featured on the track. There is a group of deleted scenes, with optional director's commentary. Scenes include: Rendezvous in Tacheles (03m:34s), Back to the Future (00m:37s), Planet of the Forgotten (01m:10s), Lara's Castle: Neighbor Ocker (01m:16s), Lara's Castle: Love Letters (03m:27s), Mother Won't Get Well Again (02m:57s), Side Effects (02m:11s), Yardwork (01m:59s), Father Has Started All Over Again (02m:45s), and Why Didn't You Tell Me Sooner? (03m:00s). All scenes are presented in lower quality anamorphic widescreen. Lenin Learns to Fly (20m:33s) is a lengthy piece on the visual effects that went into transforming Berlin into its former self. It begins with the director talking about the critical role these effects played in his film, and the necessity for them to blend in unnoticed. For the most part, they succeeded admirably. Mini Making-of Featurette (01m:28s) is nothing more than a brief montage of behind-the-scenes footage set to music. Uncut "Aktuelle Kamera" Broadcasts (07m:53s) is a collection of Denis' bravura news pieces created to fool Alex's mother. The film's theatrical trailer, along with the trailers listed above, rounds out the impressive package. By the way, don't worry; everything here is subtitled. Despite some award nominations, this film never made much of a splash here in the States. However, it is a heartwarming, comedic look at the love between a mother and her son, set against the political turmoil of Germany's reunification. Columbia's disc is stocked, much like Berlin's post-Wall Coca-Cola machines.